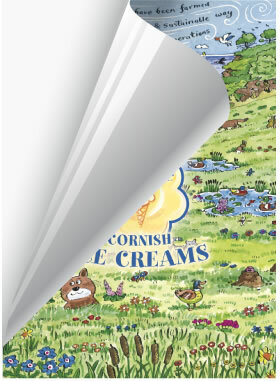 Self adhesive vinyl is a popular material suitable for many different applications. It is available self coloured in hundreds of colours and finishes for simple cut lettering or to combine with printing with even more options. Printing on vinyl film can be used in ways as contrasting as a stamp sized sticker and a fully printed vehicle wrap. Vinyl can be used on most surfaces, walls, windows, doors even the floor with the right non-slip laminate. There are also other self adhesive films available that give different effects such as polished metal, etched or blasted glass, reflective, fluorescent, mirror finish or even real gold!